Whether you're a first-timer or a seasoned veteran, five months gives you plenty of prep time to train for and complete a full marathon. Before even considering a 26.2-mile race, develop a base of running three to four days per week for six months or longer. How you choose to spend your run training over the next 20 weeks depends on your fitness level, your marathon goal and your schedule. More isn't always better even when you're embarking on an endurance event. Your marathon goal determines your training strategy. This may be your first race and you're happy to finish. Perhaps you have run one or two marathons before and are ready to better your time. More advanced runners may aim for a Boston qualification -- a BQ -- or a sub-three-hour finish. Your goal helps you determine how many days per week you'll run and how to structure each of those runs. For example, a person with a "to finish" goal may merely focus on fitting in the requisite training miles, while a person after a BQ will conduct focused workouts consisting of speed and hills. You also have to consider the toll training will take on your free time -- a plan that has you running six days per week may not jive with a busy job and hectic family life. You'll need to plan at least three days of running, say Bill Pierce, Scott Murr and Ray Moss in their book "Run Less Run Faster." Most plans have you running between four and six times per week. For novices, four times per week running at a relatively easy pace readies the body for the 26.2 miles you'll spend on your feet for race day. This includes a long run on the weekend performed at 1-1/2 to 2 minutes slower than your projected race day pace, or something that feels conversational. You should feel free to intersperse walk breaks into any of your training runs, especially as a beginner. Intermediate and advanced runners may plan five to six days of running. 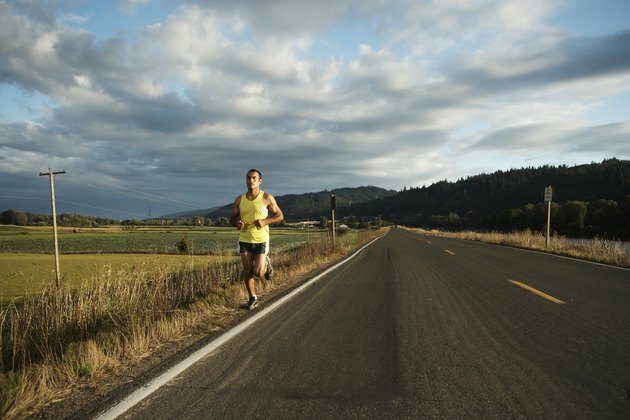 These runs usually consist of a day of speed drills, five to 10 intervals of 400 to 1,600 meters done at a fast pace with short recovery jogs between them; a sustained 30- to 60-minute run done at a hard, competitive pace; and a long run which may include some moderate speed drills or a fast finish in the last few miles to simulate the kick you'll need on race day. Perform any non-structured workout runs at a moderate pace for 45 minutes to an hour. In week one of a five-month plan, your long run will be between five and 10 miles -- depending on your starting fitness level. The mid-week runs will also be conservative in distance, given you are working your way up to between 30 and, for competitive athletes, 80 or more miles per week. Each week add about 10 percent to your plan, so if you cover 25 miles your first week, the following week you'll cover roughly 27.5 miles. Ramping up faster than this can lead to overtraining and increases your risk for injury. The length of your mid-week and long runs should also increase as the 20 weeks progress. Most training plans also incorporate a "pull-back" week every three to five weeks that involves backing off your mileage slightly so your body has a chance to recover before you ramp up again. Coaches vary widely in their recommendations as to how far you should go for your longest training run. Most plans recommend at least one 20-mile training run, arguing that the adrenaline you produce on race day will get you through the final 10K. With a five-month training plan, intermediate and advanced runners may perform two or three of these 20-mile training runs with a week of lower mileage between them. Some coaches, like Olympian Jeff Galloway, recommend running farther than 26.2 miles in training to build the endurance for race day. Ultimately, you have to decide how your body responds to long mileage and if multiple 20s or longer runs will take too much of a toll on your system. Most coaches agree, though, that your last long run -- regardless of the distance -- should occur three weeks prior to race day. Spend the weeks leading up to the race tapering -- reducing your mileage by 20 to 40 percent and the intensity of runs each week. Rest completely at least one day, and maybe two, prior to the actual competition. Your last week may consist of a mere 20 miles -- which after several weeks of twice this amount seems like a vacation. Most marathon plans account for at least one cross-training workout each week during your five months of training. Cross-training may consist of strength training, cycling, swimming or another form of exercise that targets your muscles in a way different from running. Cross-training helps keep your training interesting and encourages more balance in your body's muscles. It also gives you an opportunity to work on strength and cardiovascular fitness without putting more jarring impact on your frame. How Long Does It Take to Get in Shape for a Marathon?